Planning a trip to Japan? With a land area of over 1.5 times that of the United Kingdom, Japan is no small country. Fortunately for visitors though, whilst less so for folks living there, most of Japan's geography is covered in mountainous areas hence limiting most of its population as well as visitor attractions to a few major cities. Combine this with an incredibly clean, efficient and hyper modern transportation system of air, rail and road networks, getting around is generally very convenient and very accessible in Japan. Recently, I was in Japan's main island of Honshu to visit the 3 key cities of Tokyo, Kyoto and Osaka. Whilst 98.5% of Japan's population (2013 statistics) are ethnic Japanese who (obviously) speak & read Japanese, the folks there have done a really good job in making travel around Japan most doable for the self traveling foreign visitors. These days, there are plenty of English signs available, and help for a lost visitor is almost always just an ask away of a nearby local. Even so, whilst doing this third trip to Japan, I still found it challenging at times to navigate the complex transport network and unique culture of this land. As such, I have put together some tips which I have learned over time. Hopefully, you find these tips useful if you should be heading that way .. Please also do not hesitate to let us know if you have better tips and tricks to share by posting a comment to our Facebook page. Cheers! Japan has some of the busiest airports in the world. Tokyo's Haneda Airport (also known as Tokyo International Airport) is in the list of World's Top 10 Busiest Airports. Three (3) of Haneda's routes (Sapporo, Fukuoka and Okinawa) are listed in IATA's Top 10 Busiest Air Routes in the World! 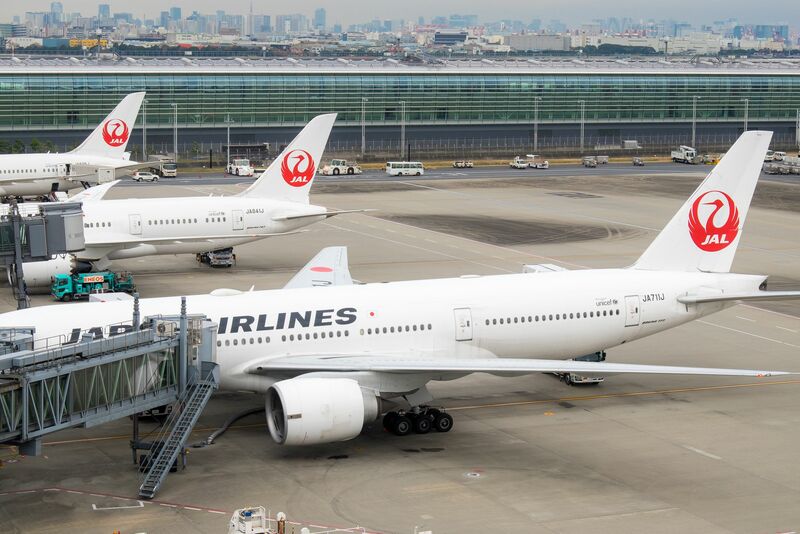 Given the statistics, over 78 million passengers went through Haneda Airport in 2015, with an average of over 50 aircraft heading in or out every hour. You can only expect that there will be many people passing through that airport and all major airports in Japan. Even through Japanese airports are very busy, it has always been a really good experience passing through them. My early morning sunrise arrival into Tokyo's Haneda Airport in late November was really hassle free. I cleared immigration, collected my luggage and sailed through customs rather quickly. After which I went for a hot cup of coffee and a croissant, opting to get on the train bound for Tokyo City only after the infamous mad morning rush period (i.e. after 9:30am). There were plenty of storage lockers to park my medium size suitcase whilst I wandered through Haneda - including a stroll through the top floor of the airport and out onto the nice large outdoor observation deck there. If you are heading out of Japan, queues can get quite long at peak periods and some aircraft gates can be quite far away (given the size of the major international airports). You will likely need extra time to (queue for and) take a light rail followed by a fair bit of walking to reach your outbound aircraft. TIP: For international flights, do go to the airport early (2-3 hours prior to departure time), check-in, clear outbound security, drop off your tax-free receipts, pass through immigration, and find your departure gate as soon as possible. Do all that without getting too distracted by all the many last minute shopping facilities in the area! Japanese trains operate on legendary world renown efficiency. Trains always depart on time - well almost always, otherwise it would be in the news - see "apology after Japanese train departs 20 seconds early"! Private companies, including the predominant JR (Japan Rail) group and others, own and operate these train lines. To get between places within a city, the subway (i.e underground train, also known as the metro) is your best friend. These trains almost never see the light of day except at fringe stations located outside the city metropolitan areas. They run very regularly, and if you miss a train, the next one is usually mere minutes away. They are easy to use and their stations are well numbered for each subway line - typically with an alphabet and number, e.g. station M21. Connections to other subway lines are usually within walking distance with good sign posting along interconnecting subterranean pedestrian walkways. When you arrive at your first major city or airport in Japan, get an IC card - there are many different brands of IC cards, and they are mostly interoperable between cities. For example, if you enter Japan via Tokyo, get the Pasmo IC card (or Suica IC card if you are arriving into Osaka). A card allows you to enter/pay/exit train stations, pay for bus/tram rides and more. Note: the IC Card machine will light up the slot(s) which it's expecting money to be inserted into. The machine will take automatically a 500 Yen value as a deposit for the card when it issues you a new card - which is loaded with the remainder of the money value you have inserted & selected. Whenever you are about to run out of stored value on your card, simply "charge" your IC Card with more stored value by inserting cash at any of the IC card machines located around subway/train station entrances. 1. With this IC card, you are all set to get through entry gates to any train other than the Shinkansen. The remaining stored value on the card will show up when you tap to enter the station and the value from your ride(s) will be deducted when you tap to exit a station. Easy, there is no need to worry that you have not bought the right ticket(s) for the the right train line(s). 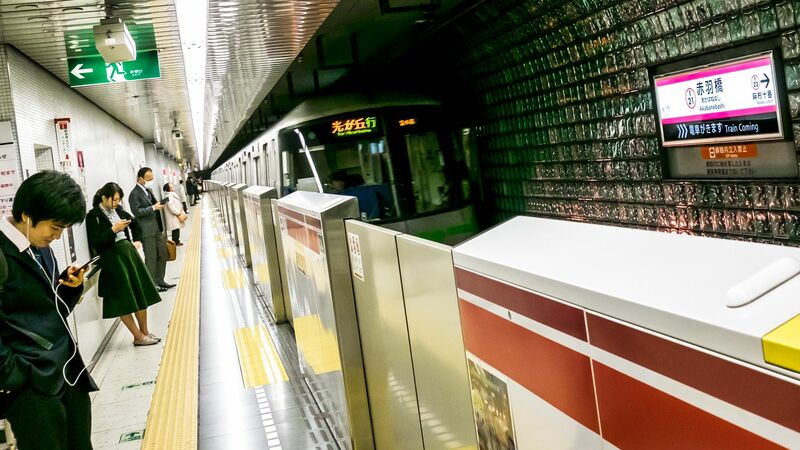 Without an IC card, buying separate tickets for each train ride can get rather confusing, especially when your journey involves changing train lines along the way. 2. If you have mobile data (or from your hotel room/wifi-cafe), open Google Maps and enter your destination. Google Maps will tell you which line you should get on, the terminal-destination (for train direction) and how many minutes it will take to get there. Alternatively, look for a train map and manually figure out a route to your destination - this method might take you a while .. When taking a subway, note the name of the end/last station of the train you should be taking. To get to a platform for trains going in the opposite direction, you may need to walk up/down the stairs to cross over to the other side of a platform. Trains of the same line in the same direction can have different end-points (terminal stations). This matters if the station you are going to are only serviced by trains with certain terminal stations. The markings on the ground indicate the car number of the train you will be queuing to enter. Some cars are women only cars and male passengers should not be in these lines/cars. Trains may not stop at all stations along a line. For some lines (i.e. not always the case), you may find that the subway/train line is marked with names pre-fixed with "Rapid Limited Express", "Limited Express", "Rapid Express", "Express", "Sub-Express", "Semi-Express", "Local", etc. Take the time to access which of these trains on this line will stop at your destination station (marked by an "O" circle on the station) and only board these trains. The Local train will stop at all stations en route, but all the express trains will skip/bypass stations along the way to get you to stated destinations in shorter time. Locate a rail chart nearby to find the right trains you should be boarding. There are a number of private local/express rail operators in Japan. The most notable are those of the JR (Japan Railways) group. Others have names like Kintetsu, Eizan, etc. These trains cost a fair bit more the further you travel on a trip. Your (subway) IC card will work for taking (both local and express) rail trains. The tips from the Metro/Subway section above also apply here. In general, when given the choice between a subway or a local/express train line, use the subway line. Local/express trains like JR Lines usually have many more train types ("Rapid Limited Express" .. "Local"), are less frequent and have various terminal-station routes - which can be rather confusing for non-locals. Also, as these surface trains service extended areas up to a fair distance away from central city centers and into neighbour states, if you make the mistake of boarding the wrong train, you may find yourself getting off at a remote station and trying to find your way back from sub-urban Japan - where there are usually fewer English speaking folks and signs around. On the other hand, Metro/Subway lines service core central city areas, are frequent and you cannot get too far wrong. Unlike the other train categories, the Shinkansen (i.e. bullet train) is the train to take for traveling between cities. These trains are reliable and fast - very fast! Nozumi / Mizuho: The quickest train service to get between major stations as it does not stop at many stations along the route. Note: Unlike the other service types, these services are not valid for JR Pass holders. Hikari / Sakura: The next fastest train service. It skips some stations along its route. Kodama: The slowest Shinkansen service. This train stops at all stations along its route. Similar to the local/express rail service, remember to pick a Shinkansen service which will actually stop at your departure and arrival stations! Reserved: Guaranteed preallocated seat in a specific train-car. Get this type of (more expensive) ticket for larger groups and families with young children to seat together, especially for travel during peak travel seasons/periods. This ticket is only valid for the specific train (train number and departure time). Your train-car-seat numbers will be printed on your ticket. Non-reserved: Non-guaranteed seating, for use on any train (service type/time) within the day specified on the train. Simply use any available seat in any car assigned to non-reserved seats - see announcement board above the train platform for the car numbers for non-reserved seats. Usually cars numbered 1 to 3, or 1 to 5, etc., are allocated for non-reserved seats. Gran Class: Most spacious (i.e. First Class) seats, only available on some of the newest trains. Green Car: Very spacious seats. Ordinary Car: Normal good seats. The least spacious, but perfect for the majority of us! This is the type of car for non-reserved seats. Your **IC card will *not* work** for Shinkansen trains (unless they are pre-registered with Shinkansen). You can join a queue at the Shinkansen ticketing office to buy your tickets. 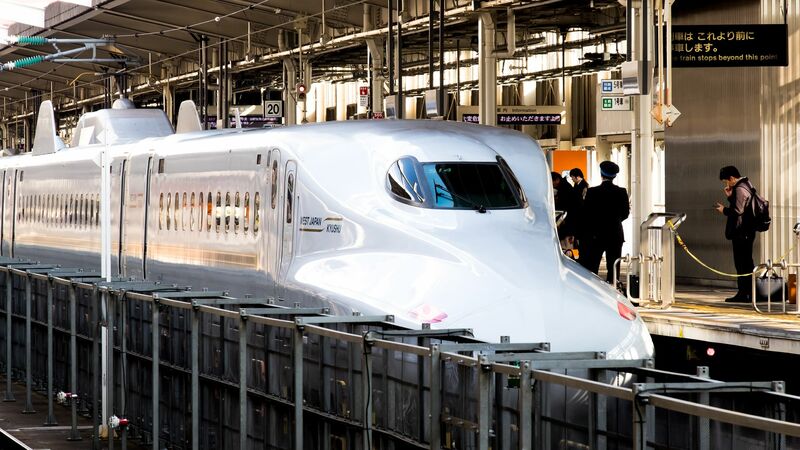 To skip the lines, buy your Shinkansen tickets from one of the Shinkansen ticket machines. These are usually located right outside the entry gates into the Shinkansen station. When you buy your Shinkansen ticket(s), you will usually be issued with two (2) separate tickets for each train service/trip. Occasionally, you might get a combo ticket. See if you can spot these two ticket types (required for each trip) in the photos below. The pair on the left was for my trip from Shin-Osaka station to Himeiji; and the pair on the right is for my trip back to Shin-Osaka on the same day. Both trips were on non-reserved seats. To enter the gates, insert both tickets (one after the other) to get through. Collect any ticket(s) that pop back up on the further end of the gate post - you will need this ticket(s) for use to get through the next set of entry gates ahead - when there is a separate Shinkansen only area at some stations. Likewise, when exiting the station, insert both tickets into the gate to exit the area. Collect any ticket which might pop up on the further end of the gate post and collect it for use at the next set of gates up ahead. For all ticket types, you will need to need to board/alight only at the specified departure/arrival stations specified on your ticket. Be at your train platform & car number queue (10 mins or more) ahead of time. Ideally, you should be at the correct platform/car row 20 minutes before the train arrives. If a cleaning crew is there, they will board the train first and tidy up the train. Board the train only after the cleaning crew completes their job, which should only take a few minutes. There are a number of pre-paid discount passes which you can get to potentially save some money. There are many such passes, the most notable of these passes is the Japan Rail Pass which can be purchased online before you enter Japan. 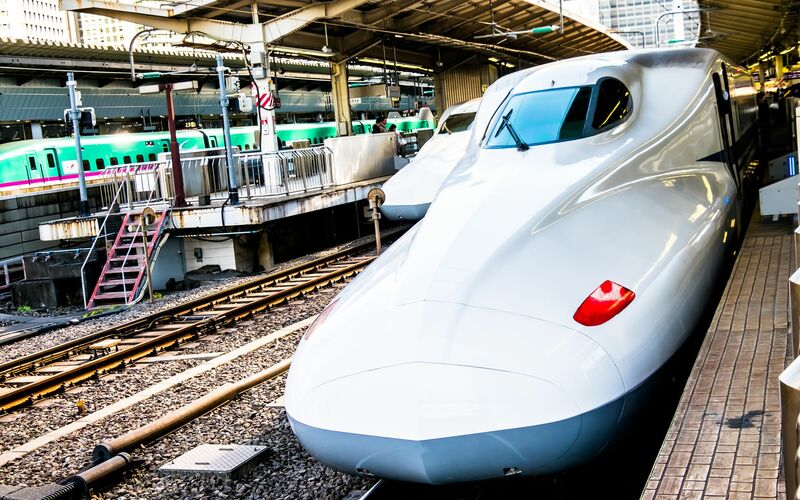 These passes help you save a bit of cash if you will be travel quite a bit by Shinkansen. When traveling with trains, it is highly recommended that you bring at most a mid-size suitcase (on wheels) and a small daypack. If you have a huge suitcase or multiple large suitcases, using an inter city bus service with a cargo hull will be more convenient. Choose trains (versus flights) for domestic travel. Whilst domestic flights may be available, trains (and sometimes buses) will be your ideal form of transportation within Japan. I have found the Shinkansen (Ordinary Car) seats to be much more comfortable and convenient versus flying. There are no x-ray security checkpoints to clear and you can be at the train platform just 15 minutes prior to departure time - Japan trains are almost never late. Airports tend to be some distance away from city centers (especially Narita Airport!) and can take hours to travel to and even more to clear airport check-in and security. On the other hand, Shinkansen trains usually stop at stations located smack in the center of town. Well, we have covered quite a fair bit on trains in Japan here. There are plenty more cool train types in Japan. When there is no train service to take to your desired destination, a bus service will be your last bet. Whilst trains are easier to use and more comfortable to ride in than buses, a bus service beats excessive walking anytime. Similar to buses, there are small light rail/tram services around which operate in a similar manner. For folks coming from most countries, you may also find that things work a little differently on Japanese buses ..
Board from the REAR door. If you are not using an IC card (same one you use for trains), have exact change for payment ready with you when you leave the bus. Pay the driver as you head out by the front door. If you do not have exact change on hand, head for the front of the bus/tram right after boarding the bus (if you can), insert your notes/larger coins into the machine and collect the exchanged coins which drop out. You should now have the exact change for payment before you alight later. Photo: Payment / Change Machine, located next to bus driver. You will need to have exact change available if you will be using cash/coins. Photo: The same Payment / Change Machine, this time located next to the light-rail driver here. Note the small yellow arrows which show where you should insert your notes (or larger coins) to get small change which drops out into the black bin at the bottom-right of the photo. Tapping your IC Card on the IC CARD pad is way easier for making payment (before you exit the vehicle). As your desired destination arrives, press a stop buzzer to notify the driver - that you wish to alight at the next stop. Head towards the FRONT door. When the bus/light-rail stops, make your payment in view of the driver by either (a) inserting your exact payment in coins into the drop box; or (b) tapping your IC card (e.g. Passmo, Suica, etc.) on the IC card panel, and payment will be deducted from your IC card. Exit the bus/light-rail via the FRONT door. Most city buses & light-rail in tourist places like Kyoto charge a fix fare (about 220 to 230 Yen per person, see signs on the bus) for a trip within the city. They also usallly have LCD displays and announcements indicating the stop is coming up next. There are coin lockers located conveniently across Japan for you to leave luggage, shopping (and whatever else you can think off!) for a few hours. The larger the train station or airport, the more lockers you will generally find. Some lockers accept IC cards in place of 100 Yen coins. During my trip across Japan, Google Maps on my phone was very accurate with its recommendations for the right trains (line, number, stops and times) and/or buses to take to get to my various destinations. I highly recommend you have this app installed on your phone along with data-roaming or a pocket-wifi. Well done Google! Hope the above info helps you get around busy Japan, and blend in better with the locals (well, at least to not cause a human traffic-jam! ).